“There is pressure already but it is normal, I will not allow it to throw me off-balance"
Newly appointed coach of Enugu Rangers, Gbenga Ogunbote can feel the heat. He has a mandate to qualify the side for the CAF Champions League. According to him, the pressure is due to Rangers’ nightmares in the 2016/2017 Nigeria Professional Football League season where they finished 13th with 53 points. “There is pressure already in Rangers, considering peoples’ attachment to the club. “Rangers did not finish in a respectable position last season and the supporters want the club to always feature in Confederation of African Football competition. “There is pressure already but it is normal, I will not allow it to throw me off-balance. “I have been in this system and pressure is part of the game, so this one is not different. “Last season, Rangers did not get it right and the supporters are patient enough, but this season they may not be that patient. 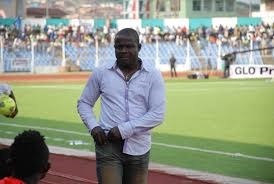 Ogunbote is a former coach of Enyimba, Sunshine Stars and 3SC.